Leading businesses are combining communications technology with radically redesigned workspaces to free employees to work in more innovative, collaborative ways, a study claims. Electronics manufacturer Philips, pharmaceuticals company GlaxoSmithKline, and Australian investment bank Macquarie are among the organisations claiming significant benefits from restructuring the way their employees work. The concept, dubbed as the hybrid organisation, is gathering momentum as more employers look for ways to help their staff work more efficiently and effectively, the study from Microsoft claims. Macquarie Bank has redesigned its office spaces to encourage employees to collaborate and to increase the likelihood of chance meetings between people from different departments that can generate new ideas. It has replaced fixed desks in its London office with shared workspaces tailored to different activities, open meeting rooms and glass partitions, which encourage people to move around the office. "Two independent studies have shown very positive results in terms of productivity," said Macquarie's director of design, Anthony Henry. Within three months of opening its redesigned office, 60% of its staff had brought their friends and families in to view it, he says. 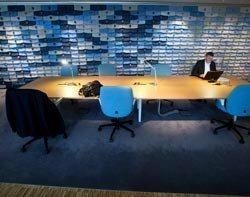 Philips is promoting hot-desking and mobile communications across 13,000 employees in 30 sites worldwide, as part of its workplace innovation programme. Since it made the changes, company surveys show that workers are feeling happier at work, says programme director, Peter de Winter. "We want to know whether our people feel more content at work in the new environment and that they are making a difference. Since the programme started, we have seen as much as 20-30% uplift in scores," he said. The electronics company plans to extend the project to cover a further 5,000 people in 20 offices over the next few years, eventually reaching 40,000 employees. GlaxoSmithKline has made savings in real estate costs after introducing hot-desking as part of its "smart working" initiative. It has reorganised its offices so people can chose quiet or collaborative workstations. "The aim is to create a set of objectives and policies that bring the workplace together to help people perform better, encourage new ways of working, entice new employees into GSK, use our space more efficiently, and provide employees with the tools and resources to make them feel supported," said Colin King, GSK's worldwide vice-president of real estate and workplace. On a smaller scale, West Yorkshire Fire & Rescue Service is using collaboration tools to help its staff in 48 fire stations access and share information across the region. It has given staff laptops with instant messaging and presence technology to allow them to communicate remotely with their colleagues. Previously it could take four to six weeks to query information because of the manual process involved. Now it takes minutes, says IT manager Darren Stone. "We have got over the cultural issues of bringing laptops into meetings and tapping away, because people have seen the power of having all the information at your fingertips," he said. The study suggests that, at a time of tight budgets, the hybrid approach can allow CIOs to do more with less, if they work closely with other parts of the business. Philip Ross, CEO of consultant Unwork.com, estimates that a 1,500-strong office in central London could save £6m a year on real-estate costs by replacing fixed desks with flexible working. "The cost of provisioning a desk is £1,200 to £1,300 per person per year. On an average working day, over half the desks lie empty in any one building," he said. Moving to flexible working can cut office space costs by 25-30%, he says. Dave Coplin, director of search at Microsoft, says that breaking down the walls between different departments is an important part of the hybrid strategy. "You almost stop people from sitting together in teams. The result you want is cross-fertilisation, sharing ideas, even though they are working for different clients. The organisations that have done that have had a much better experience of innovation," he said. What is a hybrid organisation? Makes decisions based on people, workplace and tools in combination. Empowers individuals to maximise their impact. Balances short-term priorities with long-term vision. Uses resources efficiently to effect desired outcomes.